Arthur Newmark has been collecting the FAO Albums and Boards for 15 years, but has not found a complete reference for this series. This list represents his attempt to gather all he has found about what Boards, Albums, Medals and other collections have been issued by the FAO. He produced about a third of this list by cataloguing the albums and boards in his own collection and adding in whatever additional information has been contributed by other collectors. The FAO Boards were issued as an alternate format to the Albums. 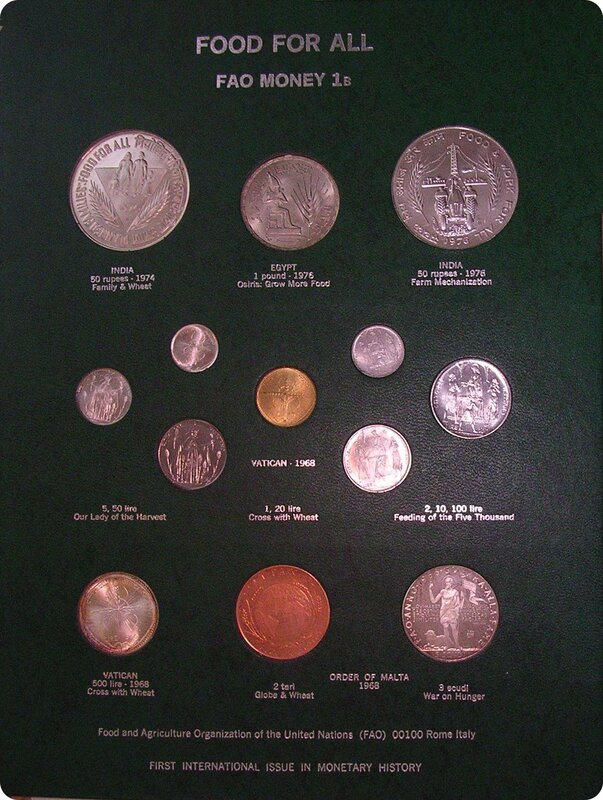 The basic collection of Boards contained fewer coins than were contained in the Albums. Boards 1A, 1B, 2A, 3A, and 4A were issued to permit collectors who chose the Board format to obtain the same pieces contained in the Albums. If you are aware of any official FAO collections not listed here, or can fill in the the contents of any of these collections, please contact me. Undoubtedly, the hand transcription leaves room for ERRORS. Please contact me if you find errors on this page. Home Page. Albums. Boards. Other Collections. Medals. I thank the people who have contributed to date. If you have any corrections, or additional information, please contact me. 1 Yuan KM 547 1969 Dominican Rep.
. Presumably the most exclusive of the FAO Money Pages. When the FAO released the Panel format, around Dec. 1973, it was conceived of as way to permit display of a subset of the collection contained in the books. 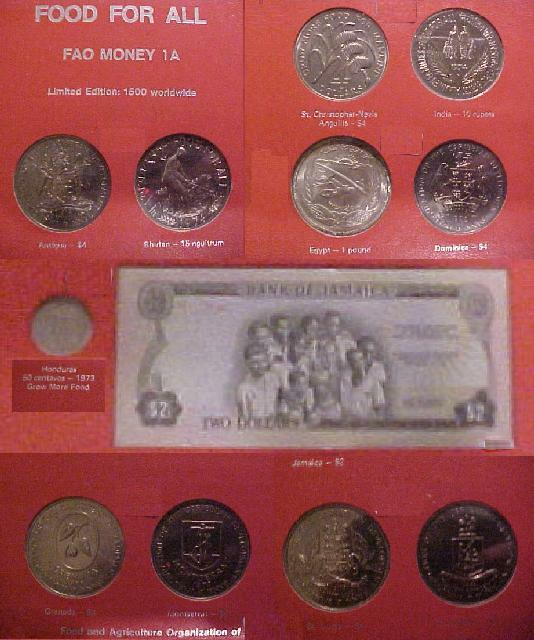 See Collector notes 8, 9 and 11. Some time in 1974, the MMP began ofering the "optional" panels to permit collectors to have a complete collection in the alternate format. The first "optional" panel was 2A, followed in November 1974 by Panel 1A. Panel 3A was announced in July 1975, alongside "regular" panel 5. Panels 4A and 6 were announced in January 1976. 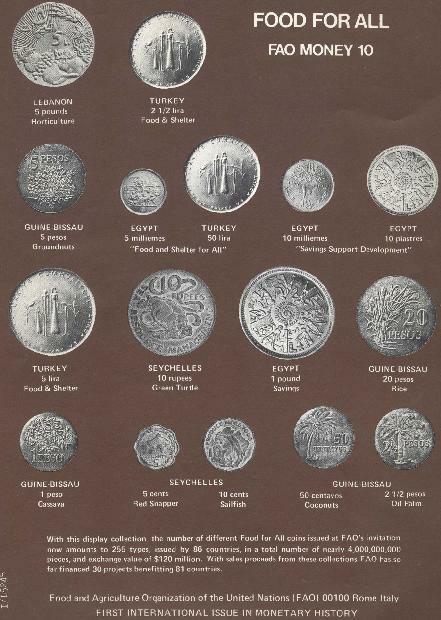 By the time Panel 1B was devised in May 1977, the MMP had exhausted its supply of the Vatican and Malta coins as well as one of the India pieces. Panel 1B was therefore released with 11 of the 13 coins missing. Presumably an "original" Panel 1B will have only 2 coins. A "complete" Panel 1B, as illustrated here, will have been filled in some time after issue. 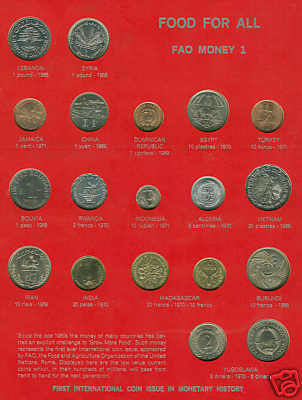 See Collector note 21. 1, 2, 3, 2A, 4, 1A, 5, 3A, 6, 4A, 7, 8, 1B, 9, 10, 11, 12. 1000 Pesos M pn 92?? I have examined 2 versions of Board 3 (tan) with respect to the labeling of the space for the Korea 50 Won. Version one is labled "1972", and has square edges. Version two is labled "1973", and has rounded edges. 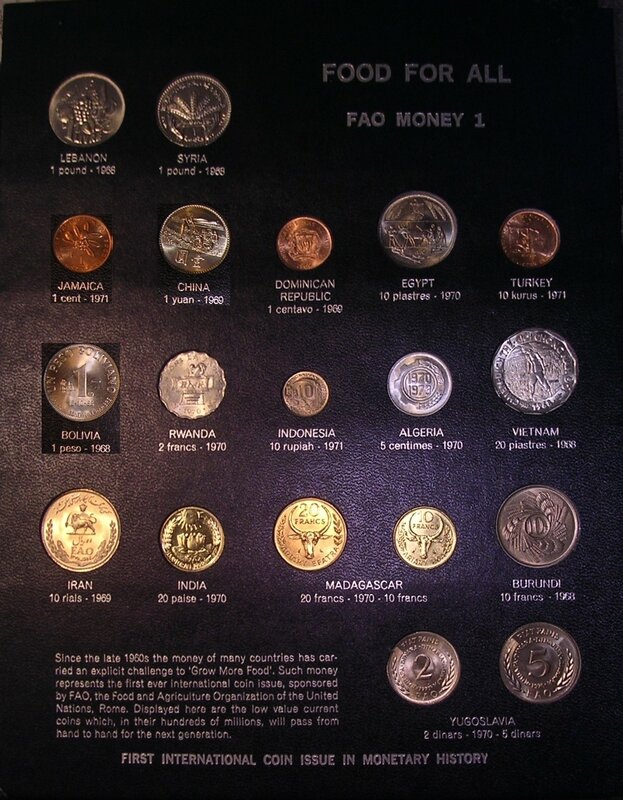 the 1972 date and had new boards printed in response to reports of 1973 dated coins appearing in the 1972 slots. 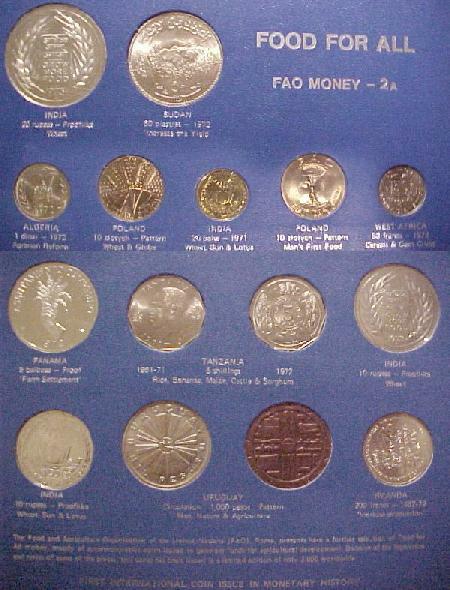 Three out of five 50 Won coins I examined in FAO holders were mislabled. 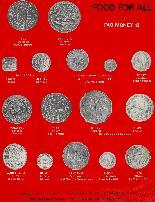 5 Milliemes KM 53 1973 U.A.E. 1 Fil KM 1 1973 U.A.E. 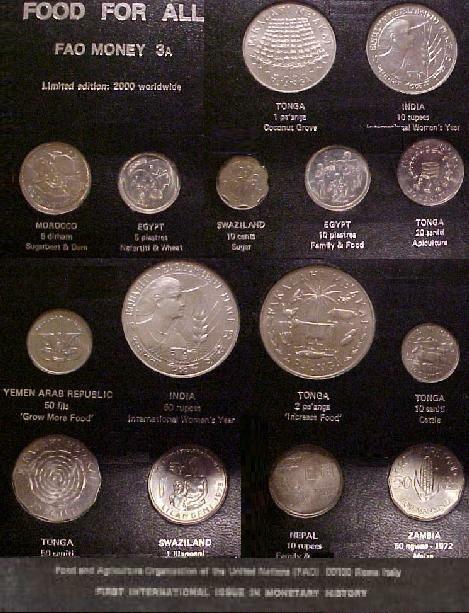 5 Fils Y 38 1974 Yemen Ar. Rep.
25 Fils Y 40 1974 Yemen Ar. Rep. Struck in 1975 and 1976. ** I've recently been alerted that there was an error in the Isle of Mann ½ Penny. An early production error omitted the "PM" mintmark from the reverse. This error coin appears to have been included in 6 pieces I've examined from Board 8 and Album 6. SEE WCN Note. 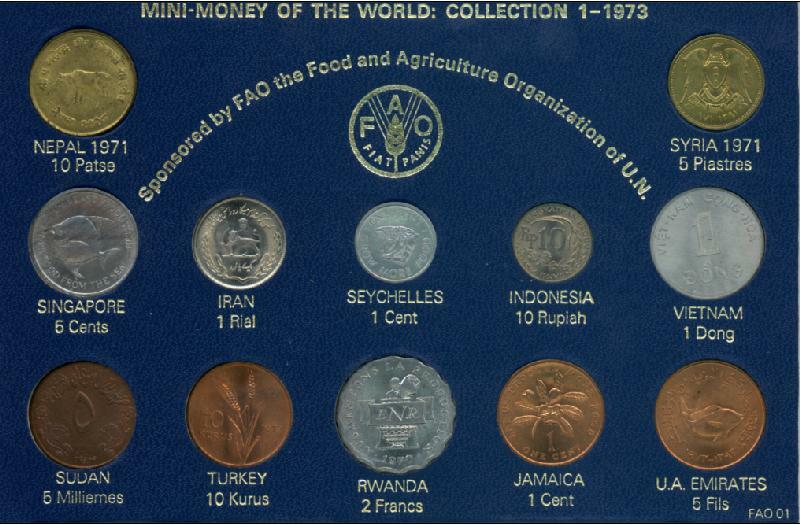 Both this issue and the Royal Mint World Collector Pack reflect the FAO mission of creating circulating low denomination coins illustrating the goal of increasing food production. I have found no FAO literature or brochures describing this set. 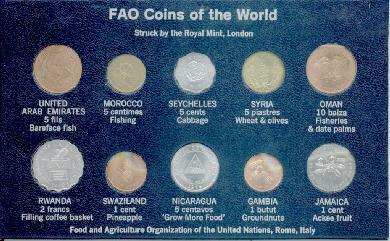 Please contact me if anyone has an original FAO literature regarding this or similar items. 1 Cent AH1393 1973 U.A.E. Anyone who has information on this series, please contact me. Issue Prices and Sales prices. 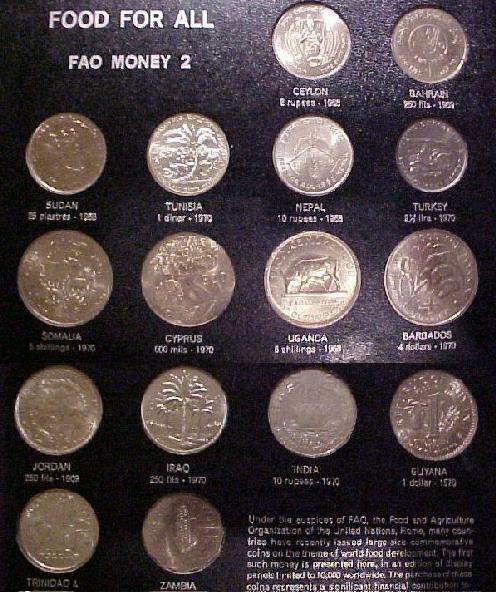 Note: These Collections were sold for varying time periods by the FAO MMP at VARYING issue prices. The FAO MMP typically raised the prices over time.